The legendary life and tragic death of Marilyn Monroe has made her a lasting Hollywood icon, even after all these years since her passing. In the early 1990’s, I created these 3 images of Marilyn in an attempt to show a more vulnerable human side of her that I hadn’t seen artistically captured before. 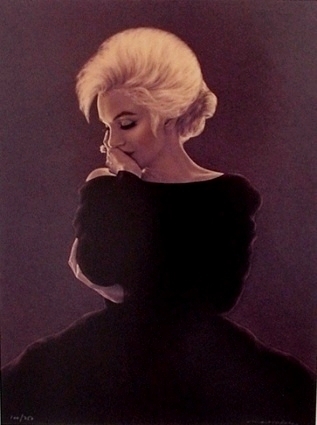 These Marilyn images were the last portrait images I rendered before I switched to using landscapes as my subject matter in all of my future art works. The original image of each rendering was done on an archival paper using chalk pastel, prismacolor pencils, and airbrush. Each original image took about 4 months to complete — I spent just about a year completing and perfecting these 3 images. The originals were then reproduced as limited edition photo prints, to make them look as photo-realistic and lifelike as possible. There are 250 S/N images per edition (each image). The images are 13" x 17" plus a 2" white border around each image and are $175.00 each, unframed. There are only about 10 to 15 prints left of each of these 3 images.